Screenprinting, an immediate process, carries a rich serial range and unique possibilities for translating drawn, painted, photographic and digital images into complex explorations of color and composition. Participants will use diverse image sources and color applications, while learning direct stenciling techniques and how to layer images. 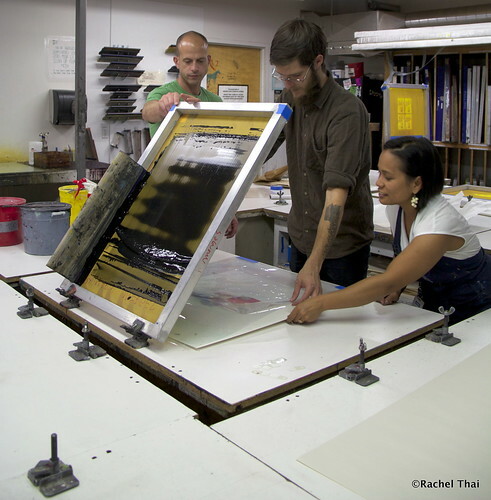 Presentations cover historical and contemporary work in screenprinting. Palmarin Merges attended the San Francisco Art Institute and received her MFA degree in Printmaking in 1999. She has had numerous shows in Japan and throughout California, and at Blackfish Gallery in Portland. She has taught at Pacific University and teaches at Pacific Northwest College of Art in the BFA and CE Programs.